Explore hidden gems such as National Radio Astronomy Observatory and New Mexico Museum of Natural History and Science. 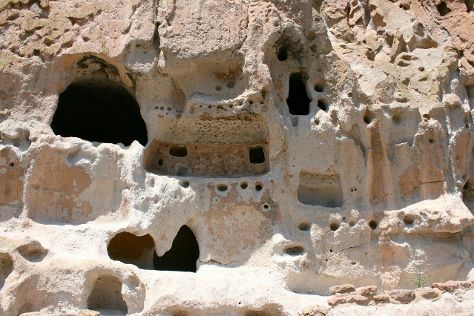 Explore Albuquerque's surroundings by going to Kasha-Katuwe Tent Rocks National Monument (in Cochiti Pueblo), Santa Fe (Museum of International Folk Art & Liquid Light Glass) and Bandelier National Monument (in Los Alamos). There's still lots to do: appreciate the extensive heritage of Albuquerque Old Town, get engrossed in the history at Indian Pueblo Cultural Center, and enjoy unforgettable views with a balloon tour. For traveler tips, more things to do, photos, and other tourist information, use the Albuquerque trip itinerary planner. The Route module shows you all the different ways you can get to Albuquerque. Expect a daytime high around 57°F in February, and nighttime lows around 31°F. Finish your sightseeing early on the 20th (Wed) to allow enough time to drive to Taos. Kick off your visit on the 21st (Thu): see the interesting displays at Millicent Rogers Museum, then contemplate in the serene atmosphere at San Francisco de Assisi Mission Church, and then hit the slopes at Sipapu Ski & Summer Resort. Here are some ideas for day two: view the masterpieces at Taos Clay Studio and then tour the pleasant surroundings at Taos Ski Valley. Plan my Taos trip by asking Inpirock to come up with tips and suggestions. Traveling by car from Albuquerque to Taos takes 2.5 hours. Alternatively, you can take a bus; or do a combination of train and bus. Plan for little chillier temperatures traveling from Albuquerque in February, with highs in Taos at 47°F and lows at 19°F. Wrap up your sightseeing on the 22nd (Fri) to allow time to drive to Las Cruces. Kick off your visit on the 23rd (Sat): look and learn at Roswell Museum & Art Center, then stop by Alien Zone Area 51, then see the interesting displays at International UFO Museum and Research Center, and finally admire the majestic nature at Bottomless Lakes State Park. On your second day here, get outside with Mescalero Sands North Dune OHV Area and then admire the masterpieces at Anderson Museum of Contemporary Art. For traveler tips, more things to do, where to stay, and other tourist information, read Roswell trip planner. You can drive from Taos to Roswell in 6 hours. Other options are to do a combination of shuttle, flight, and car; or do a combination of shuttle and flight. In February, Roswell is somewhat warmer than Taos - with highs of 64°F and lows of 30°F. Wrap up your sightseeing on the 24th (Sun) early enough to drive to Las Cruces. Las Cruces, also known as "The City of the Crosses", is the seat of Doña Ana County, New Mexico, United States. On the 25th (Mon), examine the collection at Basin Range Volcanics Geolapidary Museum Deming, learn about winemaking at St. Clair Winery & Vineyard, and then contemplate the long history of Fort Cummings 1836-1886. Get ready for a full day of sightseeing on the next day: admire all the interesting features of New Mexico State University, then stroll through Dripping Springs Natural Area, and then get great views at San Agustin Pass. For traveler tips, reviews, maps, and other tourist information, refer to the Las Cruces road trip planning website . Drive from Roswell to Las Cruces in 4.5 hours. Alternatively, you can take a bus. In February, daily temperatures in Las Cruces can reach 64°F, while at night they dip to 34°F. Wrap up your sightseeing by early afternoon on the 27th (Wed) to allow enough time to drive back home.